Media consumers were confounded in late March of this year when news broke out of Mike Hughes’ failed attempt to prove the Earth is flat by means of propelling himself on a rocket from the Mojave Desert in California, some 300 km outside of Los Angeles. Outlets around (the most important word in the sentence), the world took notice of the Associated Press bulletin and, even though the protagonist had injured his back in a hard-landing after reaching the considerable altitude of almost 600 m, reduced people in all corners of the globe to laughter. Still many felt profoundly confused for Hughes, a.k.a. ‘Mad’ Mike, was self-taught rocket engineer and his vehicle the fruit of his own knowledge and labor. How was it possible that someone versed in the proverbial rocket science believed that the Earth is flat? How could you reconcile these branches of knowledge if they do not seem to stem from the same tree? Generations have been brought up with Earth’s sphericity, the more privileged of its contemporary inhabitants travel around it. Indeed, our modernity (and if you wish postmodernity) seems grounded in the fact that the world is round. The premise of the book under review is the history of how this fact came to be taught, discussed and appropriated in various political agendas in colonial and post-colonial India. 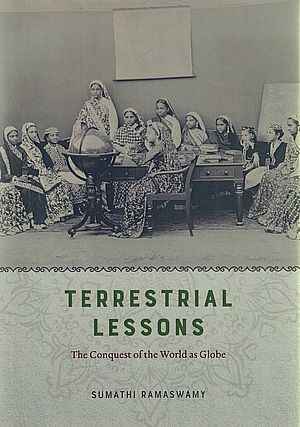 Despite its substantial length, Sumathi Ramaswamy’s Terrestrial Lessons. The Conquest of the World as a Globe is not a systematic study in the history of education or, more particularly, geography. Instead, the book spans the last two centuries and the breadth and length of the subcontinent, picking the fascinating history of individuals, institutions and specific locales to knit an impressive, argumentative and convincing story. The most prominent subject of the study, however, are the itineraries of the round objects we know as globes. Among others, the author showcases terrestrial globes that were gifted, traded and/or used in educational institutions, among the latter the humblest example is a sample from around the turn of the 20th century made of pumpkin shell in Sagar, Madhya Pradesh, in central India by (most probably) a geography teacher. The book thus adds to the growing research on the history of ‘things’, in the case of India most prominently advanced by David Arnold’s recent book on everyday technology. Terrestrial Lessons is divided in five uneven chapters, adjoined by a prologue and an epilogue, and does not follow a chronological timeline. The first chapter should be read as an extended introduction to the book as it presents the reader with the main cast as well as some of the arguments extended in the rest of the book. Chapter two revolves around the education and specifically the astronomical and geographical instruction or, as the author has put it, the ‘worlding’ of a young Maratha Prince, temporarily exiled to Madras, and his subsequent engagement with books and globes once he had assumed the throne in Tanjore (today’s Thanjavur, Tamil Nadu) as Serfoji II. The chapter could be particularly interesting to scholars working on the Tranquebar mission as it investigates connections to the Halle mission and builds on some excellent recent studies. Apart from ‘native’ aristocracy, the priestly class was also the target of early ‘cartographic evangelism’ performed by missionaries, but also civil servants and retired army men. The underlying drive was the idea that the presentation of the fact of earth’s sphericity could win new converts, a strategy that as we see in chapter three (mainly focused on North India) was often successful. Chapter four regional focus is on the Bombay Presidency, today’s Maharashtra. Here emphasis is put on girls’ instruction in geography as well as on the formation and function of institutions devoted to providing education to young women. The array of actors involved a range from European and American missionaries to ‘Indian big men’ like the Parsi businessman and reformer Manockjee Cursetjee. Although the instruction of young women on the subcontinent often reflected ‘aspirational politics’ more than anything else (and this holds true particularly for girls from unprivileged background), the ‘worlding’ had sometimes unexpected outcomes. The keenest example in this regard is Bhikaji Cama neè Patel (1861–1936) who like other Parsi young women at the time attended the Alexandra Native Girls’ English Institution in Bombay. The life of ‘Madam’ Cama is well documented and remembered chiefly for its turn to “fiery anticolonial politics“ during her early 20th-century residence in Europe (p. 206). The last chapter transports the reader to Bengal. The main character of the chapter is a figure known not only to experts of South Asian studies, but also to movie lovers around the world. Satyajit Ray’s movie character Apu from the eponymous trilogy (Pather Panchali (1955), Aparajito (1956) and Apur Sansar (1959)) and his story of transition to manhood, including scenes depicting his proficiency with the globe, are used to showcase the rite of passage of newly independent, Nehruvian India and its prevailing desire and aspiration for science and ‘modernity’. Glancing over the whole period – although not framed as such by the author – a Norbert Eliasque trickle-down becomes discernible. From Serfoji II. to Apu, globes become more accessible and, if we wish to be more audacious, from Bentinck to Cama knowledge is used in various political agendas. The book stands out with the command of language that historians have become comfortable with and, indeed, expect from a study in the genre of postcolonialism. The author refers to Jacques Derrida’s notion of aporia, customary homage is paid to Martin Heidegger (raising the eyebrows of readers unable to separate Heidegger’s personal life and work). To Ramaswamy’s credit, it should be noted that the loftier names are reserved to the prologue, while the rest of the book is consequential and clear in its statements. Although the study is generally delivered in a graceful way, there are some shortcomings that need to be mentioned here. By any standard, the book is excessive in its internal cross-referencing. While this compliments the author’s wholeness of argument, a conservative estimate of a cross-reference on every third page is trying even for the most sympathetic reader. In addition to this, there are errata that seem to have similarly escaped the publishers’/editors’ attention (e.g. misspelled citations or missing sic: “I can’t quiet describe“ (p. 231), as well as solecisms in the author’s own text: “It is also worth nothing that nothing outdated and discarded was gifted“ (p. 59)). These examples are by no means exhaustive. The study is built on a vast and rich base of sources and secondary literature. This being said, it is difficult to recommend the book to undergraduate students as sometimes general (and even specialized) knowledge is taken for granted and references to groundwork are missing. Thus, for example, when the author observes the very particular position in the colonial endeavor that white women had – “race and colonial privilege helped to leaven these women’s gendered subordination at home“ (p. 192) – there is no reference to studies that have initially pointed to these hierarchical uncertainties, paradoxes and opportunities. Finally, although Ramaswamy makes most of her primary sources, there is one case in which her analysis descends into an exercise in inductive logic, bordering with counterfactual history (p. 186). These deficiencies aside, the book excels in several ways. The study is an example of how visual materials could and should be used in historical studies. Photographs, paintings, lithographs, still frames from a movie (Aparajito), etc., are all employed not simply as an illustration of a point, but rather as a subject of analysis and occasionally become the argument itself. This mastery of visuals is hardly surprising considering the author’s previous work, but the study presents a wonderful continuation in this regard. The iconographic investigation of Varaha (an incarnation of Vishnu), who saves Prithvi (Goddess Earth) and the visual rendition of the latter as a spherical world from some point in the late 19th century, is just one fascinating example from the epilogue of the book. While the main arguments are easy to recapitulate succinctly – the sphericity of our planet is a foundational fact of our modernity and the forefront of colonialism tried to monopolize and capitalize on this knowledge – Ramaswamy’s book most precious insights lie perhaps in the fine nuances she reveals. The old story of Orientalists vs. Anglicists is vastly more complex. The author duly points that among the latter (also at various points of time) there were religious Christian as well as secular branches. Among ‘native’ reformers there were those embracing ‘Western science’ and those who were reluctant and/or favored instruction in the vernaculars. The geographical knowledge on the subcontinent itself, as one might imagine, was neither singular nor homogenous. Apart from the Islamic/Mughal cosmology, there were also competing Hindu renditions. While the most (in)famous Puranic tradition, main target of missionaries, depicted Earth as discoidal in form, from the fifth century CE there were texts pertaining to an astronomical treatise called the Siddhānta depicting earth as spherical. Authors of the latter were recognized as “strategic allies“ (p. 133) by colonial servicemen. Taking all actors together, it becomes clear that the combinations and permutations of political/educational agendas were numerous. Let me wrap up with another anecdote. In Good Bye Lenin!, a German tragicomedy from 2003, a fictional within fiction character of Sigmund Jähn, a GDR cosmonaut and the first German to fly in space, explains to a tv audience of one (!) that the Democratic Republic is rather small when observed from space and that socialism means reaching out to others – the fictional in fiction cause for the opening of borders in 1989. In 1984 Rakesh Sharma became the first Indian in space, launching from Baikonur on a soviet spacecraft Soyuz T (the same that transported the real Jähn to low orbit and back), a variation of which remains presently, one might add spectacularly, the main means for human spaceflight. Asked by Prime Minister Indira Gandhi what India was like from outer space he famously responded ‘Sāre jahāṉ se acchā’ (better than the whole world). Although planetary consciousness is foundational for our modernity, it is not uniform. In this sense, understanding its formation at different places and times and the subsequent political implications remains a critical task for the historian. Sumathi Ramaswamy’s Terrestrial Lessons is a valuable piece in this regard and an example as to how this task could be fulfilled. David Arnold, Everyday Technology. Machines and the Making of India's Modernity. Chicago 2013. Heike Liebau, Cultural Encounters in India. The Local Co-Workers of the Tranquebar Mission, 18th To 19th Centuries. New Delhi 2013. Clare Midgley, Female emancipation in an Imperial Frame. English Women and the Campaign against Sati (Widow-burning) in India, 1813–30, in: Women’s History Review 9 (2000), p. 95–121. Sumathi Ramaswamy, The Goddess and the Nation. Mapping Mother India. Durham 2009. Nikolay Kamenov: Rezension zu: Ramaswamy, Sumathi: Terrestrial Lessons. The Conquest of the World as Globe. Chicago 2017 , in: H-Soz-Kult, 10.10.2018, <www.hsozkult.de/publicationreview/id/rezbuecher-28595>.